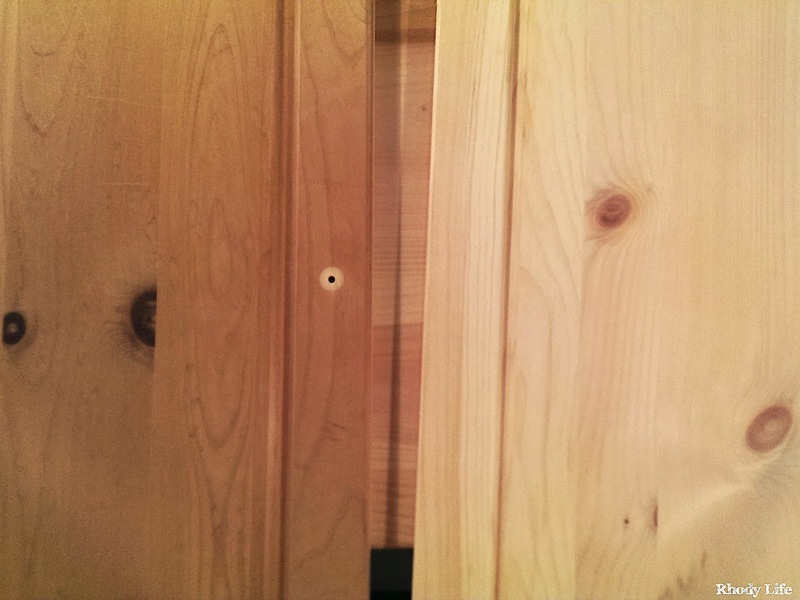 I know that I have teased you about my craft room and the progress, but today ends some of the teasing. 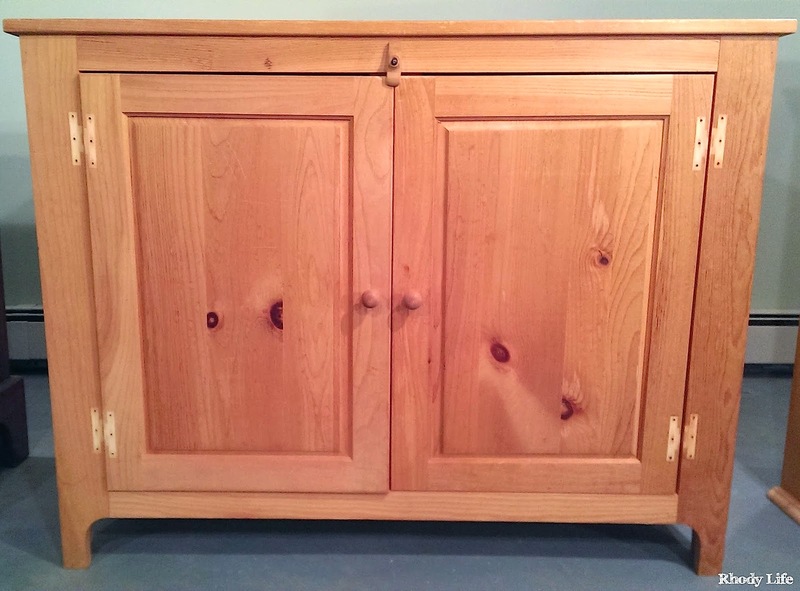 I'm here to show you how the hutch turned out, and the process that it took to get there. It wasn't as difficult as I thought it was going to be, but that's because of my palm sander and the new paint sprayer. 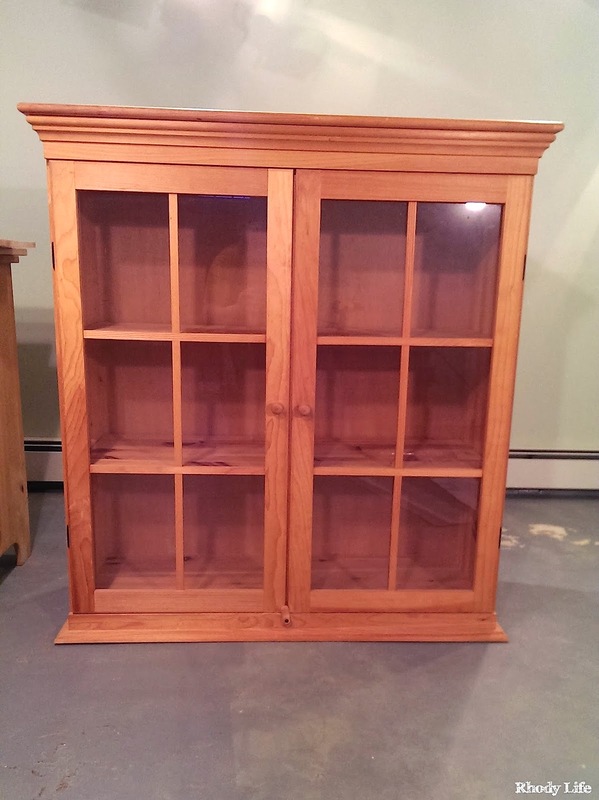 First, the obligatory before pictures, and some background on the hutch itself. The hutch belonged to my grandmother, and she kept it in a storage space just behind the kitchen in her apartment. The bottom held all of her Corningware, and the top was for food storage. It was a two-piece hutch made of solid wood, never finished, and was slightly too large for the space she chose for it. When it came time for her to move out of the apartment and into an assisted living facility, the hutch was stored in my parent's garage. It spent two years there, until Dylan and I moved into our second apartment, where we had space for it since my parents were moving to Georgia and weren't going to be taking it with them. At that point, the raw wood had aged a bit from being out in the garage for so long, and it had started turning to a darker color. I had already started disassembling the bottom part of the cabinet, so you'll notice that the hinges are already off, but that just shows you the difference in the color of the wood where it was protected by the hinges and the rest of the hutch that was out and exposed to the elements in the garage. 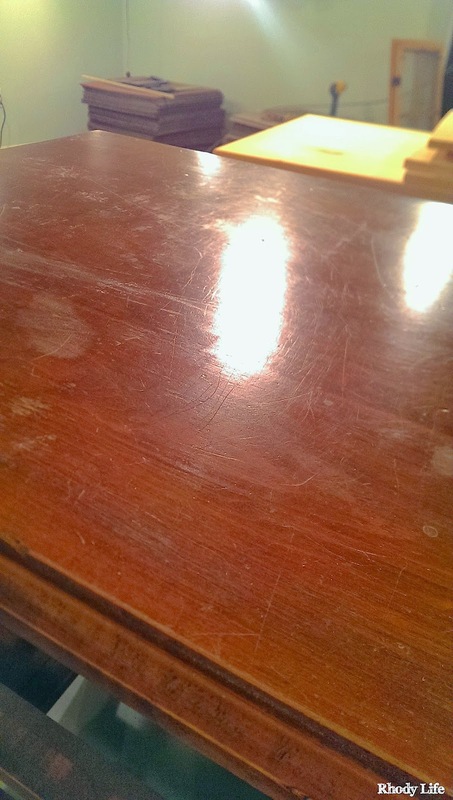 The first step in refinishing it was to sand the wood down. I wanted to get the years of dirt off of the piece and by sanding it, I would be able to make sure that the paint would be absorbed into the wood properly, leaving me with a good finish. It took me just about an hour to sand all of the shelves, the doors, and both the inside and outside of the two large pieces. I had decided to paint the inside of the hutch as well, even though the bottom part would have it's doors put back on, painting the inside white was going to help make it brighter and easier to see the contents. Painting the inside of the top of the hutch white was going to be necessary because I had decided that I wasn't going to put the glass doors back on. They made the hutch look a little too traditional, and I wanted some easily accessible storage space with open shelves, which would work out perfectly without doors. 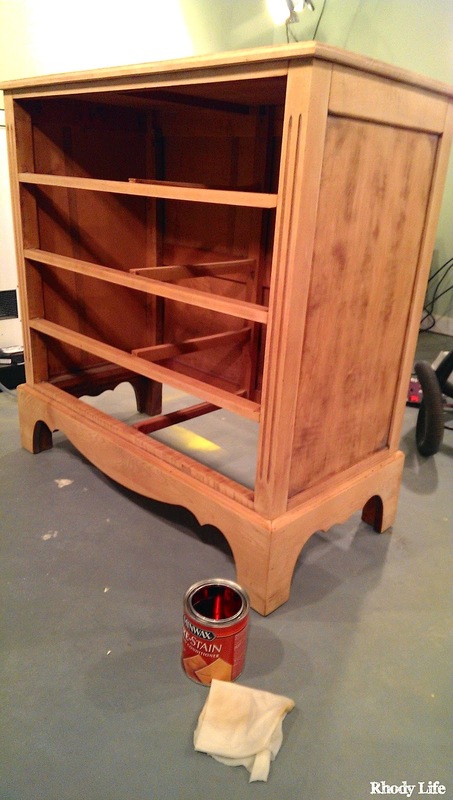 I began the painting process with two coats of primer, both of which I painted by hand with my favorite brush and mini-roller, and it took me about two hours to do the bottom part of the hutch and all the shelves and doors. I took a break to eat dinner and then painted the top half of the hutch. And I repeated that the next day. And it was so boring, honestly. In fact, I was so bored with it, that I didn't start the actual painting until I was trying out the first paint sprayer I bought. When that one didn't work as expected, I tried out a different paint sprayer, and in all my excitement, I decided to just use it on the entire thing, not just the shelves and doors as originally planned. 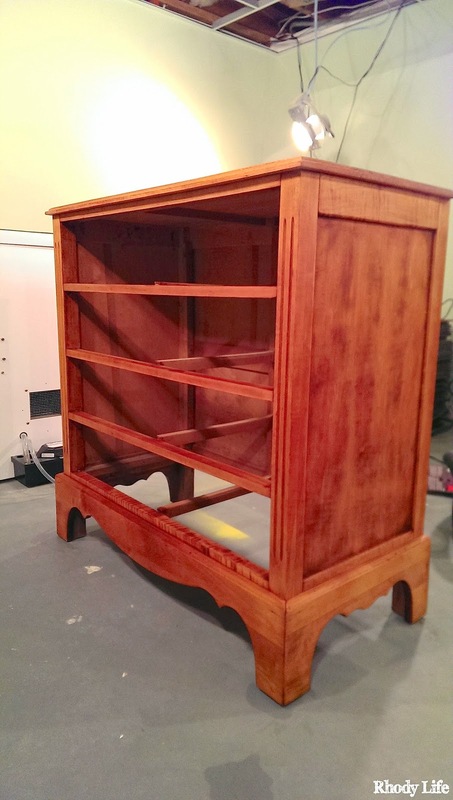 And it turns out that that was a genius idea, because the hutch only needed one coat of paint with the sprayer, and it was done in less time than it took me to hand prime just the bottom part of the hutch! Anyways, once it was finished, I had Dylan help me bring it back upstairs and into the craft room, where I pushed it into what I am hoping is it's final location in the room. I'm still not quite sure if I like it where it is, but if I need to move it around a little bit, it should be pretty easy to do so. In the meantime, however, I did populate it with some of the items from our wedding, the boxes from my favorite shoes, all of my fat-quarters, my sewing machine, the Cuttlebug, and in the closed part of the hutch are some fabric scraps and batting, and paper products. It probably won't stay that way, since I still have tons of stuff in boxes that needs unpacking, but for now, it's great! It's so funny that a dining room hutch would be the perfect solution to storage for a craft room - just shows how repurposing furniture can end up working out so well! In terms of the hardware, I didn't change it out, as the holes were already there, and the hinges were in good condition, they just date the piece a little bit. But, instead of keeping them black, I decided to prime them and then spray paint them orange! A little more color in a room for crafting just makes it happier, plus, a little more orange is never a bad thing, especially since it's my favorite color! The knobs were in good condition too, but they were just a little too small, in my opinion. I took a trip to Hobby Lobby to see if they had anything fun and playful, but I didn't realize how expensive knobs could be! So while I was there, I just went to the wood crafts aisle and grabbed a bag of 4 round knobs for less than it would have cost me for one knob! I put a few coats of high-gloss white paint on them, and then decided to pull out the paint rollers that I used for testing swatches on the interior walls of the house that I had been storing in plastic baggies since the Fall! Since they were stored in air-proof baggies, they still had a lot of paint on them, so I just took out all of the rolls and starting pressing them onto the knobs in different places. And when I had almost all of the white covered and all of the colors of the house, I left them to dry, and then put them up on the doors of the hutch and loved them! I'm so glad that I have this room started and that I now have some great storage in the space. I'm really looking forward to getting things finished, and checking another room off the list. Just a few more things to hang, some tables to set up, and a chair to find, and then this room will be done until I decide to tackle the serious lack of organization in the closet. 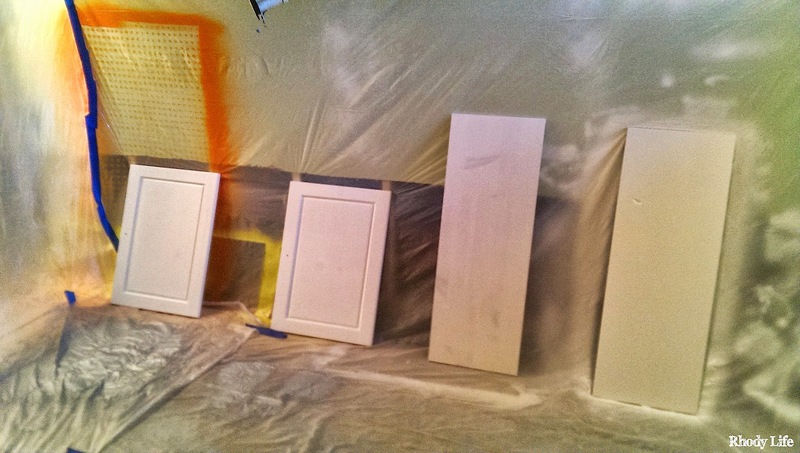 Have you ever painted a piece of furniture with a spray gun? What about decorated your own furniture knobs? This past weekend was a very busy one. We have been trying to finish up some of the projects we have started over the last few months, but like it seems to happen over here, things get partially finished and then other things get started. I really should be more diligent about finishing one thing before starting the next, as it would make my to-do list much shorter and my stress levels much lower. But, getting back to this post, yesterday, while Dylan wasn’t feeling well, I took it upon myself to get some one-person work done - specifically, installing the vinyl decal in the guest bedroom. If you remember back to the design plan that I showed you just over a year ago, I had plans to install a vinyl decal on the wall that the bed is going to be against. I had picked out the Birch Tree Vinyl Decal from Innovative Stencils and I finally got around to installing it yesterday. It had been sitting in the closet for just about a month because I had to wait for the best time to install it. That bedroom has no overhead lighting, and we haven’t purchased any lamps for the space yet, so the only light available in the room is from daylight through the windows. Unfortunately, when I get home from work at night, there isn’t enough light to install the decal, so I was lucky to be able to get it done this weekend. When I finally opened the packaging, I read through the directions that Innovative Stencils included with my decal, and they seemed really straightforward, so I started with their first step. As suggested, I took the two sheets of decal that I was shipped and began cutting them into separate sections. 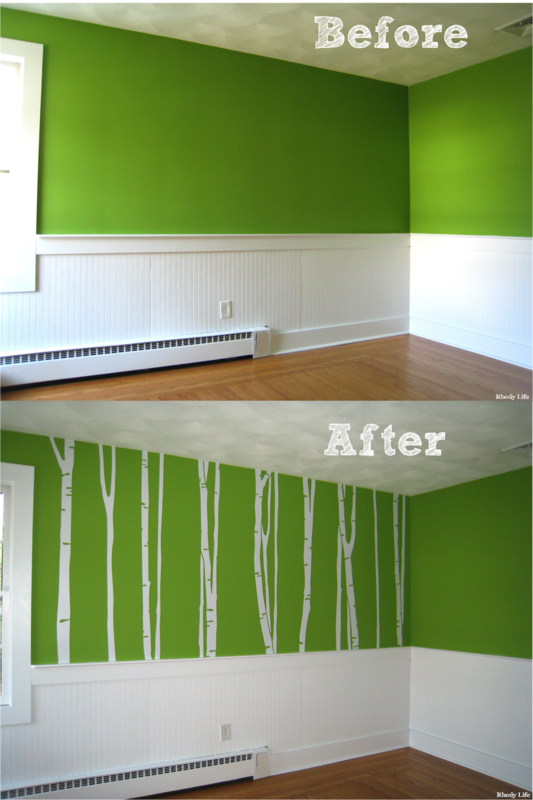 Since my Birch Tree Vinyl Decal could be installed using any pattern I wanted, I cut each tree into it’s own sheet and then I was able to arrange them against the wall so I could figure out the order that I wanted. Cutting each tree into its own sheet also made it very easy to install onto the wall later, since I could do smaller areas at a time versus one large sheet. Once I had the order laid out on the floor next to my wall, I used a few pieces of painter’s tape to hang them on the wall to figure out the perfect spacing. The sheets were very light, so I only ended up needing two small pieces at the top of each tree to hold them onto the wall. Thankfully, the painter’s tape came off easily too, because I did have to change the spacing a few times before I got it to look perfect on the wall. With the trees in place, the next step was to actually adhere the decal to the wall. Per the instructions from Innovative Stencils, I added a horizontal piece of painter’s tape to each tree to hold it in place so I could work on one half of the stencil at a time. I worked from the top down in adhering the decal to the wall because I wanted to make sure that I had a perfect match at the seam of the wall and the ceiling and the leftovers would be towards the bottom. You may decide to work from the bottom of your stencil towards the top, depending on where most of the detail in the stencil lays. For the Birch Tree Vinyl Decal, most of the detail is at the top of each tree, so that’s the part that I wanted to keep in tact. You should also be aware that since my walls are divided by chair rail, I ordered the 5’ version of this stencil, and it was just a little too long for my space, but I would much rather have extra than not enough, wouldn’t you? Innovative Stencils has many different sizes for their vinyl decals, so make sure you measure your space and select the correct size decal when ordering. Starting from the top, begin peeling the paper backing off of the backside of the decal. When you get to the point where your horizontal piece of tape is, carefully cut the paper backing away from the rest of the decal. Be sure not to cut the transfer paper or the decal itself. Using a credit card, or in my case, a rewards card from a store that is going out of business (grrrr), I flattened the decal onto the wall, starting from the horizontal tape and working upwards towards the ceiling, smoothing from the middle to the sides. 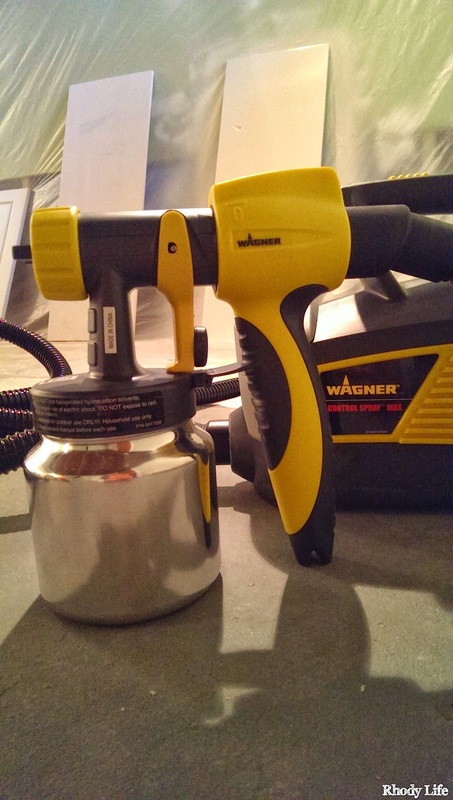 Be sure to work with small areas at a time, as you don’t want any air bubbles between the decal and the wall. If you do end up with air bubbles, wait until after the decal is completely up on the wall to try to fix them. Use the corner of your application card to move the bubbles towards the edge of the decal, and once they have been squeezed out, they will disappear for good. Don’t try to peel the decal off of the wall to fix the bubbles – you will risk stretching and warping the decal and it likely won’t stick to the wall again, as you will lose adhesive from pulling on it. When you reach the top of the decal, make sure that you have pressed it up against and into the corner of your surface, be it the ceiling or a piece of molding. Once you have the top part adhered, it will be time to do the bottom. Take off the horizontal piece of tape that was holding the decal onto the wall, and peel off the paper backing from the bottom of the decal. Repeat the process that you used for adhering the top part of the decal. After you have pressed the decals firmly onto your wall space, you are ready to remove the transfer paper. If you ended up with any overhang on the edges, like I did, you’ll want to cut that using something sharp, like a razor blade, a box cutter, or an X-Acto Knife. Once you have the edges trimmed, remove those pieces, and then starting from the top of your decal, gently peel back a corner of the transfer paper. Peel the transfer paper across the top, and then work your way down the length of the decal, folding the paper onto itself as you go. Remember to peel slowly and make sure that your decal is staying on the wall as you peel away the transfer paper. If it’s not sticking to the wall, use your application card to press the transfer paper back onto the decal to get the decal to stick better onto the surface of your wall. If you have more than one decal or different sections of one decal, repeat this step for the remaining pieces of transfer paper, and then when you are finished, stand back and admire your work. All in all, the installation of this decal took me less than an hour working by myself. It was pain-free and not agonizing at all. In fact, once I had done a few of the sections of my decal, I had a routine set and I was able to do the second half of the tree application in less time than the first half. Innovative Stencils truly has created a great product, and I’m excited to see what other decals and stencils I could use in my home. I am so happy to finally have this up on the wall, and Dylan and I are going to start working on putting some additional furniture into the room this week. I can't wait to get this room put together and then be ready to have guests spend the night! Have you ever used a vinyl decal in your home? Has this post changed your mind about some of the options available? Please Note: In exchange for a review of their product, I was able to purchase the Birch Tree Vinyl Decal free of charge from Innovative Stencils. All opinions are my own and are completely honest. I would recommend this company to anyone looking for a vinyl decal or stencil. I would like to thank Innovative Stencils for allowing me to review their product. When I was growing up, I remember sharing a bedroom with my younger sister, Emily. At times, it was great, and then again, like all siblings sharing a bedroom, there were times that it was horrible. We argued like all siblings do, but when we got along, things were great. One of the coolest parts of sharing a bedroom was that our beds could be made into bunk beds, giving us so much room for activities (Can you name that movie? Don't worry, they were made to be bunk beds - we didn't have to nail them together!). The other thing that I remember about our bedroom growing up was a bureau, which I have recently learned was a part of the bunk bed set. When we moved when I was in middle school, the bureau moved with us to our new house, and I had it in my bedroom since we each had our own rooms at that point. When I went to college, the bureau stayed in my old bedroom and I used it to store clothes I only wore during the summer and items I didn't bring to college. When Dylan and I moved in together my senior year, the bureau finally made it's way into our new apartment. It has since traveled with us to every place we have lived since then - Indiana included. And turns out, that's not the only traveling it has done. This bureau was in the house that my mom's side of the family owned in Newport, RI. The family owned house in Newport was purchased in the late 1800s, and then during the 1920's, was used as a boarding house, run by a close friend of the family. This bedroom set was purchased for one of the bedrooms in the house. Once my grandmother was married in the 1950s, the house was returned to single-family home status, and my grandmother lived there with my grandfather, my uncle, and my mom. The bureau traveled with them when they moved from the house to New Jersey and Washington, D.C., and then back to the same house in Newport again. When my mom married, she took the bedroom set, and that is how I ended up with it. Now, since the bureau was built sometime around the 1940's, it was scratched up and had a lot of marks on it from it's years of moving. With it being in my possession now, I wanted to refinish it. It was a reddish-brown color, and I wanted it darker, so using my random orbital sander, I took off all of the polyurethane and all the stain, bringing it down to it's beautiful maple hardwood. Because of the detail, I actually used my Dremel to sand some of the more difficult parts of the bureau. Before staining the bureau, I actually contemplated making a slight modification to it. The detailed rounded pieces along the bottom of the bureau are not exactly the style that I am drawn to, and since they are just decorative pieces that frame out the bottom and hide the legs of the bureau, cutting away some of the wood wouldn't compromise the structure of the bureau. I measured out the squared shape that I wanted and had my Dremel saw ready to cut, but realized that not only was my blade not long enough to go through the wood, but I didn't really want to make it look different after hearing about it's history in the family. Even though it's not my style, I figured that keeping it's original skeleton was important in a piece with so much history. Therefore, not making the cuts to the bureau led me straight into refinishing it. 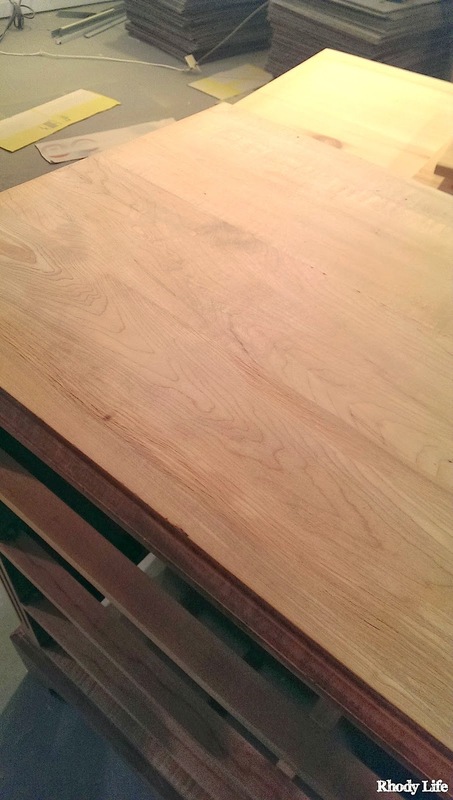 The raw wood was absolutely beautiful and in great shape, but to help it accept the new stain, I put on a coat of Minwax Pre-Stain Wood Conditioner and let it sit for fifteen minutes. It's funny too, because the color of the wood with the conditioner on it was just slightly lighter than the original color. I wish I had a better before photo, but the one I took was super blurry and I don't have my picture backup drive unpacked yet. I wiped the excess off and then applied my first coat of Minwax Jacobean stain. You can see that the last coat of poly on the top was so shiny that it was reflecting the drop ceiling grid onto the surface! Aside from that though, this bureau looks absolutely beautiful now! Two coats of stain, and three coats of polyurethane later, and the bureau was finished! Dylan helped me put it in the guest bedroom this morning, and it's the first piece of furniture in the room! I'm so excited to finally get the house put together, and I'm so excited that this piece of family history has a new place and a new look. I really love the dark tones of the wood and even though Dylan and I just spent hours painting the moulding in this room white, I think I like the way it stands out against the white beadboard and trim. I just need to find some cool hardware for the drawers and then it's all set. Oh, and it will need a lamp and some books too, just to finish it off. I've got a few more pieces to refinish, which should take me a about a week each, since I don't have a lot of time after work to get these projects done, and then we'll be at the point where we can actually look like we live in this house! 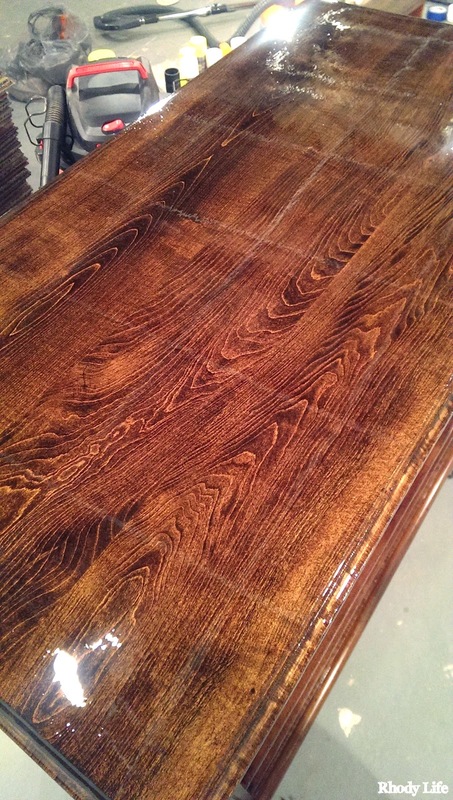 Have you been refinishing furniture lately? What's your favorite stain color?